If you have deleted staff members, or a staff member doesn't seem to have come through from your MIS, they are most likely archived in Class Charts. 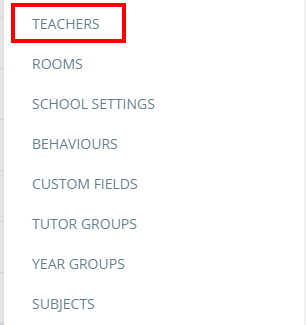 To check which staff members have been archived, click on the three lines menu in the top right hand corner of the page and select Teachers from the list of available options. You will be presented with a list of teachers. At the bottom of this list, you'll find a second list labelled Archived teachers. To restore an archived teacher to the teachers list, click on the restore icon next to their name. A popup dialog will appear, asking you to confirm your choice. Click on the OK button. The unarchived teacher will then appear in the list of available teacher accounts. The restored teacher will have a blank email address, so be sure to enter the staff member's correct email address into the Email field as soon as possible.